Hand sanitizer is always a good idea for your EDC, first aid kits, travel bags and other kits. This version features purrell's traditional hand sanitizer product in a special bottle with the military in mind. The product itself is an alcohol based gel with usually 70% of alcohol, applied over your skin and rubbed it will kill 99% of germs and bacteria, it dries very quickly leaving no trace or residue except the characteristic smell of alcohol. Among other uses hand sanitizer is an excellent fuel so it can be used as a firestarter when camping. In this version the bottle is refillable, in foliage green color and made of a very strong plastic, it can be dropped and abused in several ways and won't be easy to break. It also offers a low infrared profile for night operations, there are grips on the side to help use the bottle with just one hand. We find hand sanitizer a very useful EDC product, this version maybe more masculine than the colorful bottles you can get at the pharmacy but the product is still the same, so you can pick the container that you like the most, this is just one of many options. You can get it for $3.50 from CountyComm. The squirt S4 is a keychain multitool by leatherman conceived as an improved version of the classic Micra. In the squirt the most significant change is that tools can now be opened with the scissors closed, the tweezers can be sepparated and the handles are now in color. There are two models of the Squirt, the S4 featuring scissors as the main tool and the P4 featuring pliers as the main tool. In both models the accesory tools include a small blade, a small screwdriver, medium screwdriver, nail file and cleaner, philips screwdriver and tweezers. There is also a splitring attachment point in one of the handles. There is also a ruler in the handles in case you need to make a quick measurement. The main tool either the scissors or the pliers work great and they are spring activated the spring being very noble so it will last as long as the tool itself. 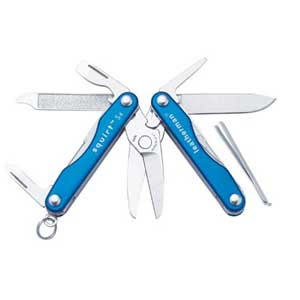 all the tools work well as expected in a leatherman, the tools can be opened without deploying the scissors or pliers. The screwdrivers are strong enough to be used for little prying and scraping jobs if needed. Compared with the Micra the Squirt is a little bigger due to the handles being thicker this is the price you pay for being able to use the screwdriver without opening the tool. In our opinion you don't have to replace your micra if you already have one but if you don't then this is a nice tool to consider. Along with the Victorinix minichamp this is a top quality and useful keychain multi-tool. The squirt is available in red, blue and gray. You can read more about it at Leatherman's official website. And order for about $25 from Amazon.